San Francesco Foods has been a part of the Toronto landscape for going on almost 60 years now. A family-owned Italian takeaway renowned in particular for its veal sandwich, competition from local shops and larger chains has more recently taken its toll, and over the last few years San Francesco has been reduced to a single downtown Toronto location (the others exist outside the core). That might be about to change: San Francesco Foods has new owners who seem intent on taking the eatery into the 21st century. It has a slick new website , and the cramped Clinton location has been renovated, with the underused deli counter replaced by a few tables and a lunch counter so that patrons no longer have to take their grub to eat at the Monarch Tavern next door. The menu's been updated (though old favourites remain) and prices raised (still very reasonable); a fourth location, albeit in Bradford, is also planned. It's a big step forward, and one that might be difficult given the quality of the food. Underwhelming is probably the best way to describe San Francesco's fare these days. 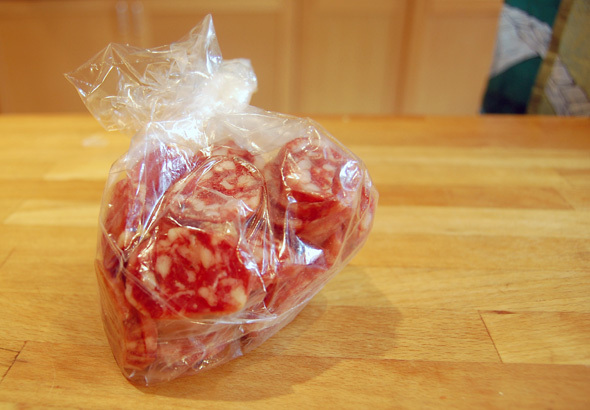 A recent addition to the menu, a small starter/side of Cacciatore ($3.50) - an Italian salami traditionally seasoned with pepper and spices - is available in both sweet and spicy varieties. It's not unpleasant, but offers little in the way of flavour or texture, and isn't better than an equivalent product you could buy at the supermarket. 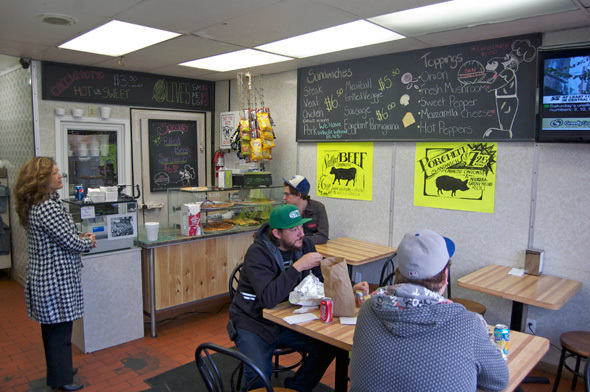 The porchetta sandwich ($7.50), another new addition, fares a little better. The pork is buttery and moist, but again lacks almost any flavour of its own, and certainly not the smoke, herb or spice one might be accustomed to in a better porchetta. A herb mustard attempts to remedy this, but would be virtually undetectable if not for its green colour. Green peppers and onions, which are particularly sweet and tasty, do a better job, but the overall result is still an average at best sandwich. 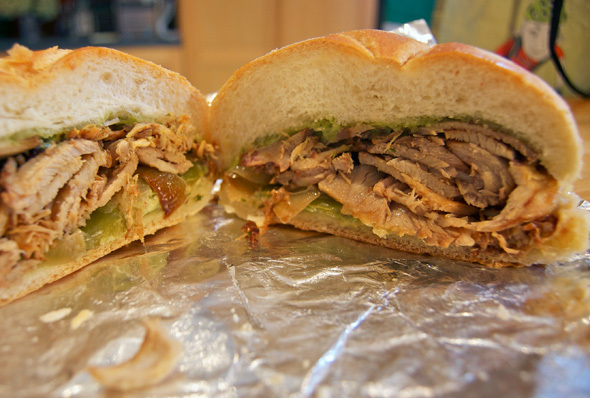 With Porchetta & Co . a five minute walk away on Dundas, there is little reason to order this sandwich. All of San Francesco's classic hot Italian sandwiches come on fresh Kaiser rolls, served with either sweet, regular or spicy tomato sauce. The sandwiches are under-sauced though, so they have to stand on the merits of the meat. 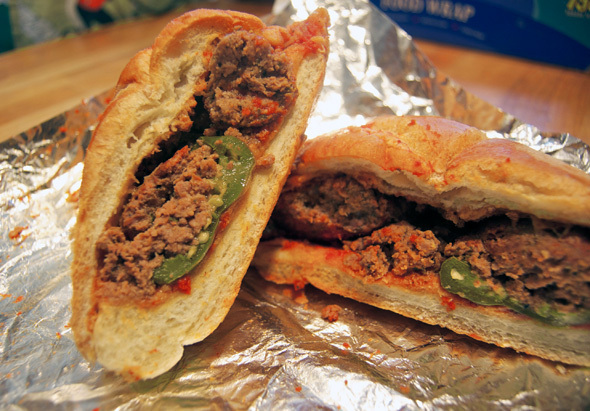 The meatball sandwich ($6) is gigantic, and trite as it may be to say, your enjoyment of it will probably depend entirely on your enjoyment of old school Italian meatballs. Veal ($6.50), the classic San Francesco sandwich, is better, tender enough to melt into the bun, but is anything but remarkable. Like everything at San Francesco Foods, the pizza slices ($2.50/4) are enormous and underdone - the slice needed another minute or two in the oven. The (relatively) thin crust pizza is a bit bready, but the tomato sauce is quite good when you actually get any - our slice was about half sauced. 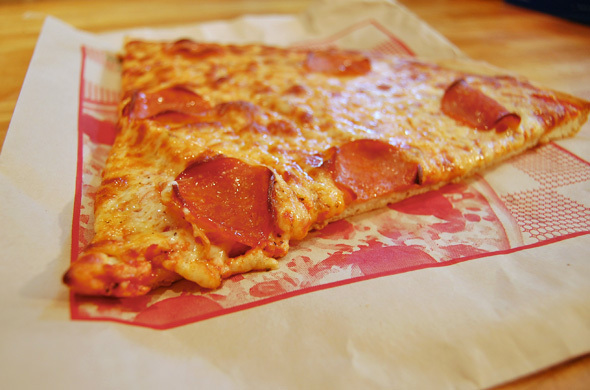 Toppings are skimpy to boot, as the pepperoni just surpasses the minimum legal threshold of what constitutes a topping. Despite these shortcomings, I'm still compelled to say it's a decent slice, and at $2.50 for the cheese/pepperoni it's hard to complain too much. There's nothing wrong with classic or old school food - there's a reason institutions become institutions. 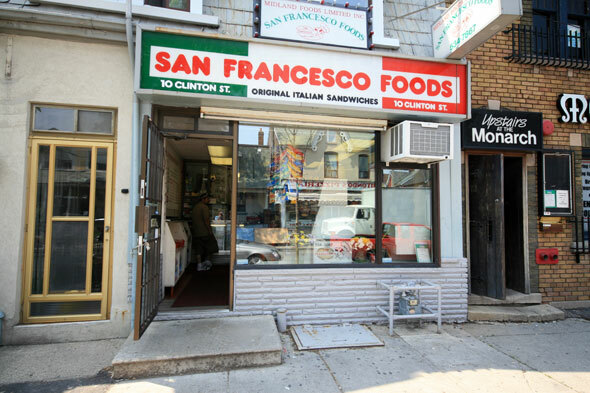 For whatever reason, though, San Francesco Foods' fare just hasn't kept pace. There's no reason why it couldn't eventually recover its previous status, but today it's hard to recommend it given that better options like Porchetta & Co. and California Sandwiches exist nearby.